Metrologic’s MS9520 Voyager® with a futuristic design and high-performance scanning system represents the best auto-triggered scanner value on the market. Metrologic’s engineering department was tasked with designing a replacement for our most uccessful product offering ever, namely the MS951. And the team delivered. Not only does the Voyager replace the MS951, it adds many new and innovative standard features such as Flash ROM, data editing, and PowerLink userreplaceable cables. MS7120 ORBIT is small in size, but BIG in performance. 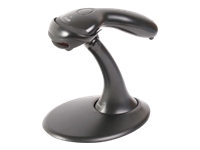 MS7120 ORBIT is Metrologic's first Point-of Sale barcode scanner to utilize holographic technology to precisely focus the scanner's laser and therefore increase performance and efficiency. MS7120 ORBIT is perfect for retail applications where counter space is at a premium and its unique contoured design allows it to be picked up to scan large, bulky items.